The county fair is happening this week, and it always wraps up with a spectacular fireworks show on Sunday night. To celebrate my new blog, I decided to treat you to a new block that reminds me of a firework that when launched, spins into the air before exploding. I call it “The Spinner”. To make this block, you will need one 6.5″ square for the center. You will also need twelve 2.5″ assorted print squares and sixteen 2.5″ white squares. Step 1 is to make twelve half-square triangles (HSTs). 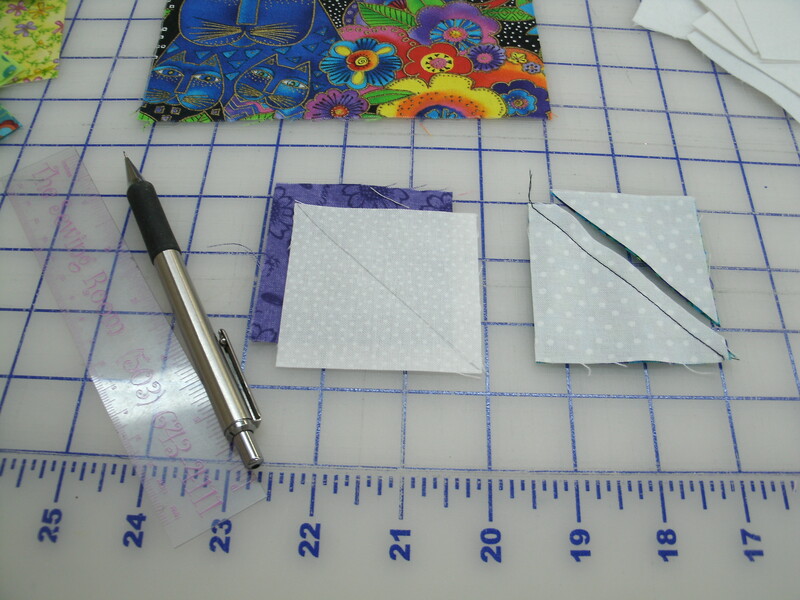 To make these HSTs, pair each 2.5″ print square with a 2.5″ white square, right sides together, of course. Draw a diagonal line on the white square and sew ON THE LINE. Sorry, I didn’t mean to yell, but quilters often sew to the sides of the line out of habit. Trim 1/4″ to one side of the seam and press open. I nearly always press my seams open, but you can press to the dark side if you prefer. 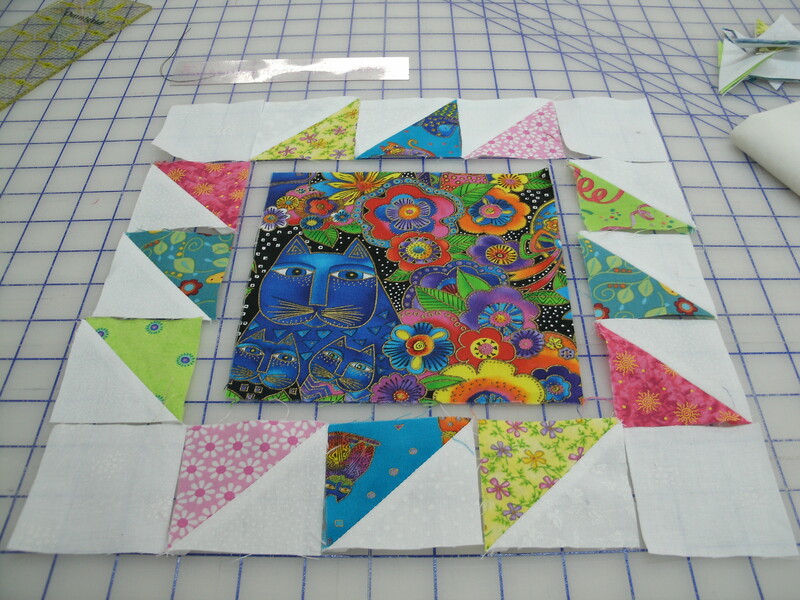 Lay out your pieces with the HST’s surrounding the 6.5″ square, and 2.5″ white squares in the corners. Sew the three left side HSTs together and sew to the left side of the center square. Next sew the three right side HSTs together and sew to the right side of the center square. Then sew the three top HSTs together, add the white corner squares and sew to the top of the block, and repeat for the bottom strip to complete your “Spinner” block. The unfinished block should measure 10.5″ x 10.5″. Of course, the next question is, what are you going to do with a 10″ (finished) block?. Well, you could string four or five together, add a border and have a festive tablerunner. One block could ne the start of a placemat. One block with a few layers of leftover batting (or a layer of Insulbrite(tm) batting would make a large hot pad. I have plans drawn up for a receiving blanket quilt and a lap-size quilt that I will share with you soon. One day One of my BQB’s (that’s Best Quilting Buddy), Kathy and I were asked to do a program for our quilt guild on ideas for scrap quilts. We made a mess of 8-inch blocks in various patterns. While we were cutting out all of those pieces, three thoughts occurred to me. 2. As much as I love scrap quilts, even I did not want to cut out individual pieces anymore. I understood why quilters buy fat quarter collections and strip-piece “scrappy” quilts instead. 3. There had to be a way to tame the pile of fabric scraps that was slowly filling my sewing room. 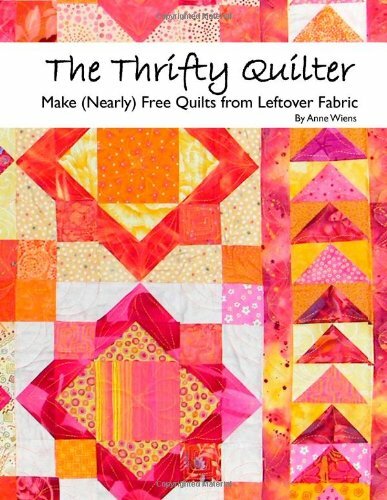 My first book, The Thrifty Quilter: Make (Nearly) Free Quilts with Leftover Fabric describes my system for pre-cutting fabric scraps into six standard units, and using those units to make dozens of traditional-style quilt blocks, which in turn can be mixed and matched to make hundreds of unique quilts in any size you need. The system is very simple, and takes just a couple of pages to explain in the book. Whenever I finish a quilting project, I cut up all of the leftover fabric strips into squares and rectangles. Let’s say I had cut a 4.5″ wide strip for the project and wound up with 12″ of it leftover. I can cut two 4.5″ squares and one 4.5″ x 2.5″ rectanglefrom it. (always cut the largest pieces possible first). Any yardage less than 1/4 yard gets cut up, too. I have a plastic bin for each of the six size pieces…6.5″ 4.5″, 3.5″ and 2.5″ squares, 6.5″ x 3.5″ and 4.5: x 2.5″ rectangles. 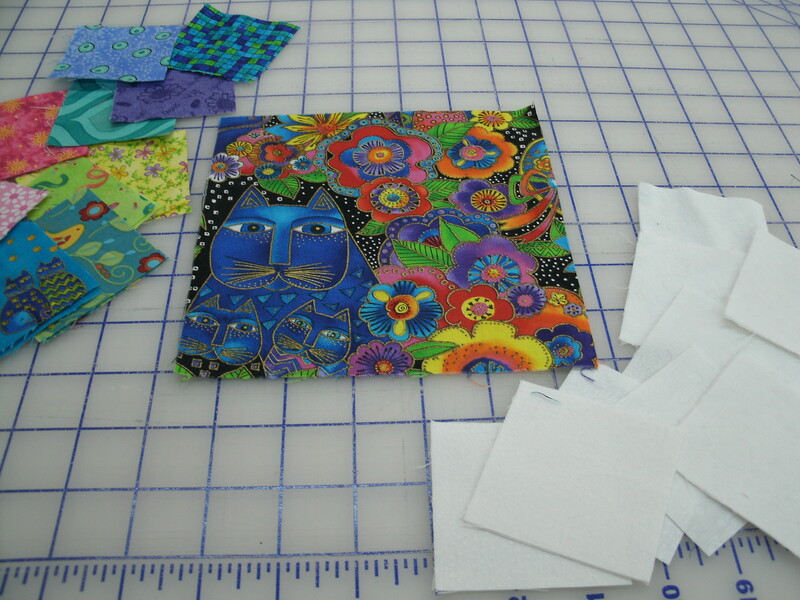 When I’m ready to make a scrap quilt, I have everything cut and ready to go, except my background fabric, if I need one. I keep a stash of background fabrics on hand, too. When I go shop-hopping with friends, I look for the sale bin, and if I find a white-on-white or beige tone-on-tone, I buy 2-4 yards of it, depending on the price. So that’s the Thrifty Quilter system. If you’d like to order the book, it’s just $19.95 (USD), and if your local shop doesn’t carry it, you can order directly from the publisher, Quiltwoman.com (where you can also purchase my other quilt patterns) or from amazon.com. 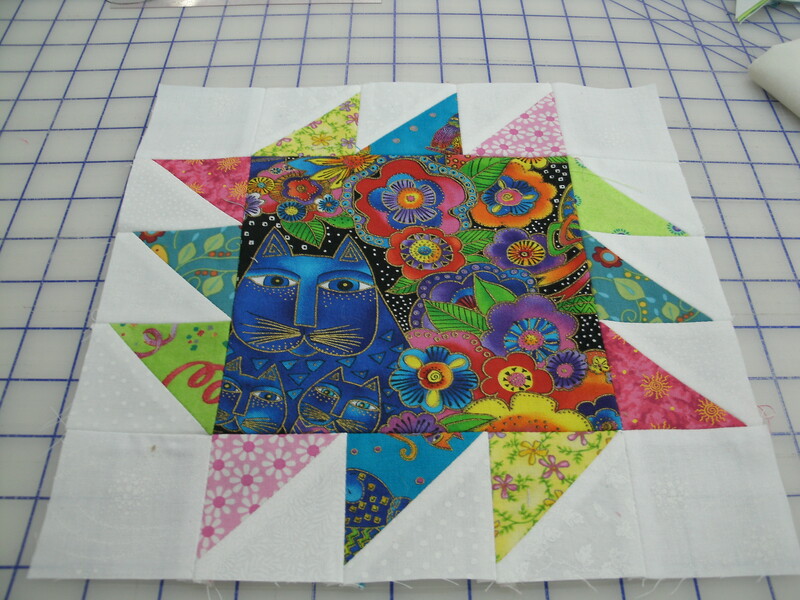 In this blog, I will give you some quilt block and project ideas. In between posts, you may want to “Like” my Facebook page, SweetgrassCreativeDesigns and join my Facebook group, Thrifty Quilters.